(NaturalNews) The 3D printing revolution has arrived, and it's freaking out governments around the world because distributed, non-centralized fabrication technology threatens their monopolistic controls over physical objects. 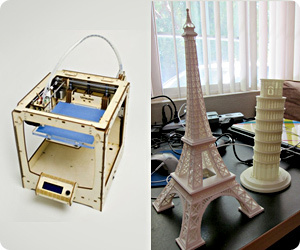 For a few thousand dollars, anyone can purchase a 3D printer (an "additive" desktop fabrication device) and print out physical objects using ABS plastic. (See list of manufacturers, below.) 3D plans are freely available to download online, and the printers are on the verge of flooding into the marketplace with a wide range of affordable, easy to use models from a large number of manufacturers.